Nancy Lammers Gross is the Arthur Sarell Rudd Professor of Speech Communication in Ministry at Princeton Theological Seminary. She earned both her MDiv and PhD from Princeton Seminary. She is a member of the Academy of Homiletics, and the National Communication Association/Religious Communication Association. Her areas of teaching interest include speech communication, preaching, especially preaching from the Apostle Paul, and worship. 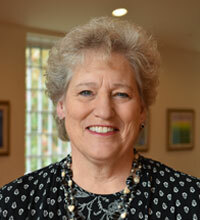 Throughout her career, she has been deeply involved in curriculum development and accreditation. An ordained Presbyterian minister, she has served churches in California and New Jersey, holding membership in the Presbytery of New Brunswick. She continues her service on the Committee on Preparation for Ministry in the New Brunswick Presbytery, where she has served for many years. She enjoys being involved in children’s ministry in a local congregation. Gross is the author of If You Cannot Preach Like Paul (Eerdmans, 2002), and Women’s Voices and the Practice of Preaching (Eerdmans, 2017).